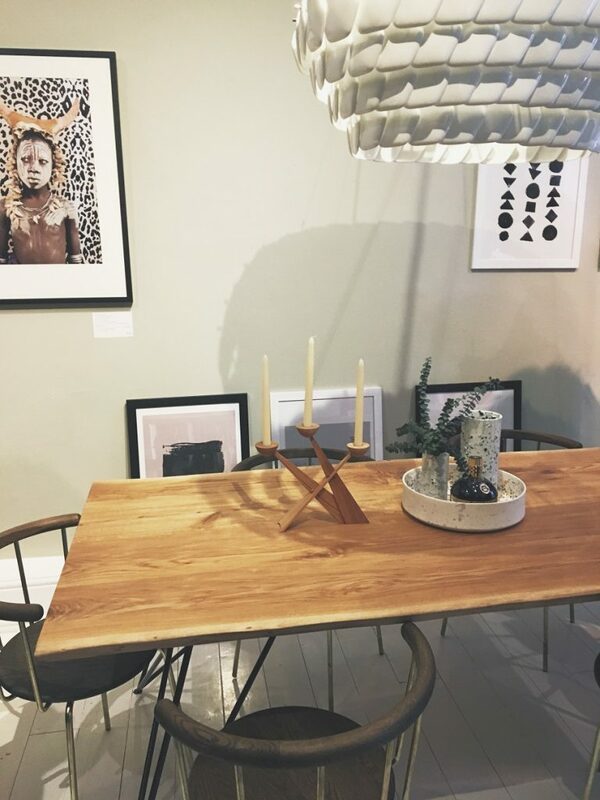 Part 2 of the series has arrived….A few weeks back we had the pleasure of popping along to the Houzz of 2018, pop-up event in Greek Street, Soho. 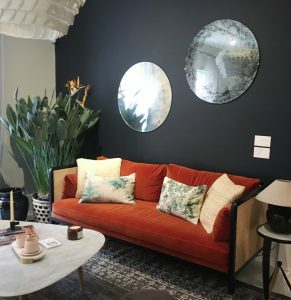 Houzz of 2018, featured a 5-storey townhouse – showcasing the latest innovative products and inspiring trends coming to the world of interior design this year. Split across 5 floors were 5 different rooms; Living Room, Kitchen, Master Bedroom, Bathroom and Children’s Bedroom. Our series of blogs will capture each room; Part 2 will focus on the designs, products and suppliers used for the Living & Dining Room area! The first room of the property to enter was the Living Room; catching your attention immediately is the 1970’s vibe, Fox Orange sofa by Red Edition France. This soft, warm and burnt orange colour, in a plush velvety texture is heavily contrasted by the backdrop of the wall-covering’s matte dark inky blue paint (colour; Cobalt Blue, by Dulux Trade). Automatically this room has modernised retro interiors, to create a cosy but contemporary space. 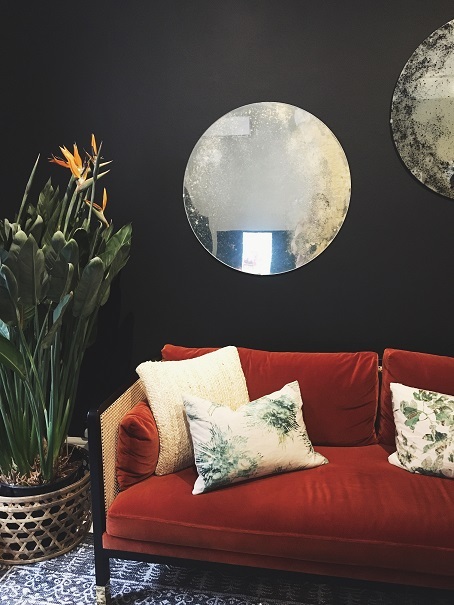 Enhancing light and maximising perceptions of space were the antique crackled metals mirrors, positioned diagonally on the wall and these were perfectly paired with a large floor plant by Patch (in a funky large, woven mono ceramic pot). Additional accessories and finishing touches such as these enabled the darkness of the room to feel relaxing but also created a refreshing and natural ambience, simultaneously. 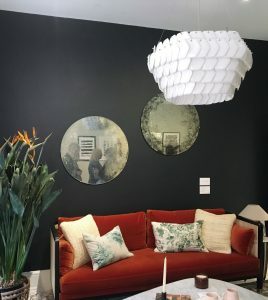 In addition, the White marbled coffee table perfectly paired up with the stunning White bone china, Cranton Hexagonal Pendant light (by Original BTC); with both materials introducing areas of large White space and hence providing further layers of contrasts and brightness. The key harmonisation of this colour palette was the complimentary (opposite) painted wall, in a very light and muted sage green (colour; Riverbed by Dulux Trade), placed on the back Living Room wall, against a natural wooden dining table (creating a ‘separate’ Dining Room space as such). NUTSANDWOOD’s solid oak dining table was the ideal teammate alongside the Riverbed painted wall; adding a more natural and botanical essence to the room (complimented by the Living area’s potted plants, by Patch). 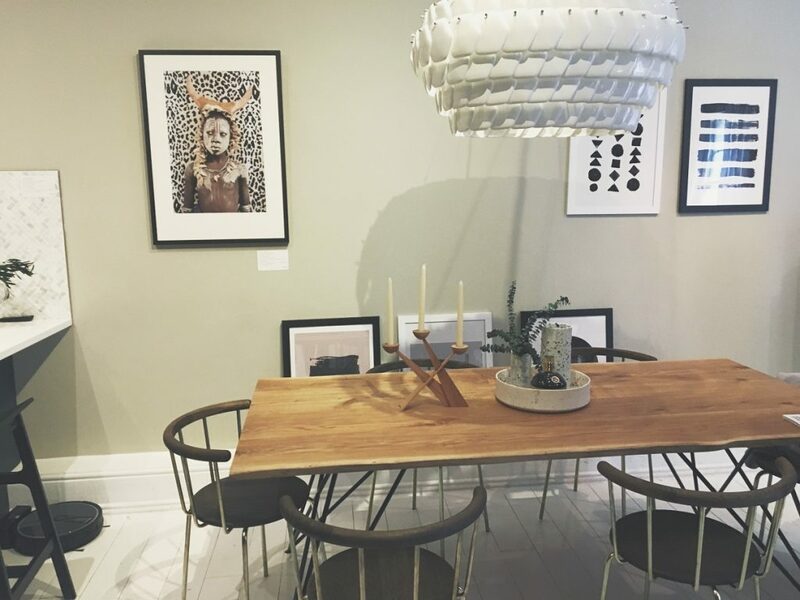 To accessorise this Dining Room, bold and abstract art prints (by East End prints) were positioned on the back wall by the table, accompanied by a centre piece of soft ceramics and earthy oak candelabras (by Spring Copenhagen ApS); to ensure seamless coordination throughout this entire communal area.